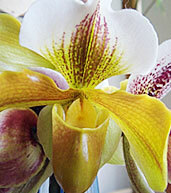 As potted orchids, Paphiopedilum are hard to come by. As freshly cut flowers, they are nearly impossible to locate and purchase. A bouquet of these rare and striking blossoms are sure to make a graceful statement in your living room. 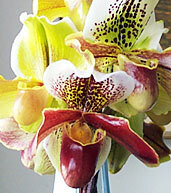 Beautiful Orchids can bring these exquisite hybrids to you exclusively from our site any time of the year. If your potted Paphiopedilum has not bloomed recently and you're looking for something in the meantime, these freshly cut Paphiopedilum might well be the answer. With proper care, these magnificent flowers can last for weeks. 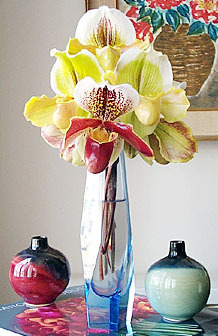 For vintage and contemporary vases, view our collection. The arrangement above was created with 12 perfect stems of freshly cut Lady's Slipper Orchids in our Vintage Blue Diamond vase (SOLD OUT - For substitution view our Studio Blue Vase). Each purchase includes care instructions and an exquisite gift card for your personal message. Each stem is approximately 10-13 inches tall bearing 12-16 blooms and comes with individual water vials. The flowers measure approximately 2-3 inches in diameter.